Your skin is your largest organ, and it deserves excellent care. It’s what we present to the world, after all, and a huge part of our identities. 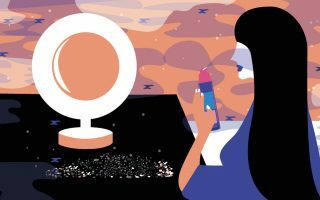 Whenever we suffer from a skin condition, whether it’s a small pimple or a significant breakout, our self-esteem and confidence can take a hit. And, unfortunately, there are several skin issues, from acne to psoriasis, that people all over the world have to deal with on a daily basis. Eczema, also called atopic dermatitis, is another that can cause great suffering and frustration for those dealing with it, but it doesn’t have to be an unconquerable problem. In fact, it’s something you can manage. 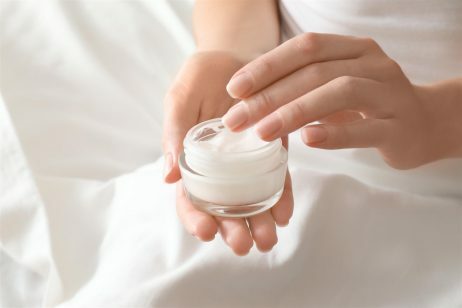 Keeping skin clean and adequately moisturized can go a long way in helping to treat and prevent eczema. There are also plenty of lotions and creams on the market specifically formulated to treat this condition. Eczema is characterized by excessive dryness, red bumps or blisters that can ooze fluid, itchiness, especially at nighttime, thickened or cracked skin, swelling from scratching and red or brownish-gray patches. It’s often found on the hands and feet, but also on the face, backs of legs, eyelids and neck. In short, it can affect the entire body and cause a lot of distress, even sleepless nights from all the itching. It can accompany asthma or hay fever, and is usually chronic. Eczema is believed to be caused by genetics rather than an allergic reaction. It results when the skin barrier, which protects from pollutants, irritants and bacteria, becomes compromised and is unable to provide proper protection. Keeping the skin hydrated can help maintain the integrity of the skin barrier to prevent or treat flare-ups. Flare-ups can occur sporadically and even go away for years sometimes. Shorter baths or showers, thorough hydration and careful avoidance of triggers can help prevent or treat eczema. 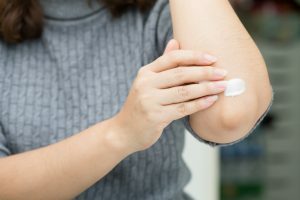 If you’re suffering from eczema, it’s recommended that you moisturize at least twice a day to keep the skin barrier strong and help alleviate symptoms like dryness and itching. Taking baths or showers that average about 10 to 15 minutes is ideal, and it’s recommended that you use warm rather than hot water to prevent skin irritation. Always pat yourself dry with a towel rather than rub, as that can also cause irritation and exacerbate symptoms. You should also make sure to avoid triggers like stress, excessive sweating, tight clothing, heavily scented soaps, laundry detergent, perfume and dust or pollen. Synthetic fragrances in many beauty products can be especially triggering, so opt for unscented items that boast more natural ingredients. There are several ingredients that have proven themselves in the fight against eczema. Colloidal oatmeal is one you’ll encounter quite often, as is glycerin, petrolatum, honey and aloe. Colloidal oatmeal and aloe are the soothing ingredients that can help calm swelling, redness and itchiness, helping you to sleep better and experience overall less discomfort. Glycerin, petrolatum and honey are highly moisturizing ingredients that can strengthen the skin barrier and replenish with much-needed moisture to help treat dryness. Glycerin and petrolatum, which are humectants, help lock in moisture to prevent water loss and to keep skin hydrated. Honey is also an antibacterial that can prevent skin infections or further aggravation during flare-ups. This is a great eczema cream with multiple ingredients that help treat and soothe the condition. It contains 1% colloidal oatmeal as one of its top ingredients. Colloidal oatmeal is very soothing and helps relieve itching. It also protects skin to keep it from becoming further irritated. Niacinamide, or vitamin B3, helps improve the skin barrier, essential in the fight against eczema. The stronger the skin barrier, the less likely that you will have eczema flare-ups. Shea butter and glycerin are moisturizing agents that help lock in moisture to ameliorate a flare-up and to keep skin soft. The main ingredient in Eucerin’s Eczema Relief cream is oatmeal. Other active ingredients include ceramide-3 and licochalcone (a flavonoid isolated from licorice root), both of which help reduce redness and itching. They also fortify the skin barrier, keeping essential lipids locked in to prevent further dryness. Licochalcone can also be found in some acne medications, thanks to its ability to relieve redness and inflammation. It has been proven to be as effective as hydrocortisone, an ingredient often used to treat atopic dermatitis. Triderma’s Eczema Fast Healing Cream promises to help reduce eczema quickly thanks to powerful ingredients like aloe, oatmeal and arnica montana flower. Aloe soothes and reduces swelling while also moisturizing to help protect the skin barrier. It helps calm the inflammation and redness that are hallmarks of eczema. Arnica montana flower is an anti-inflammatory that can help reduce swelling. This formulation also contains shea butter and beeswax to help hold moisture in to keep skin soft and healthy, alleviating scaliness and rough texture. Aquaphor’s Healing Ointment is dermatologist recommended for very dry and chapped skin. It can be used to help treat cracked skin, minor cuts and burns and extremely dry lips. The ingredients list for this product is very short, with the main one being petrolatum, a skin protectant that helps thoroughly moisturize and replenish hydration to dry skin. Other helpful ingredients include bisabolol and panthenol. Bisabolol is derived from chamomile. It can be very soothing and calming. Panthenol is a moisturizer that improves hydration to both help treat chapped skin and help prevent the condition as well. This formulation is preservative and fragrance free to reduce chances of irritation. MetaDerm provides steroid-free formulas for the treatment of eczema and psoriasis. Itching, dryness, burning, tightness and redness are all relieved with the use of this brand of creams. Ingredients include yarrow extract, aloe barbadensis leaf juice, avena sativa (colloidal oatmeal) and aesculus hippocastanum (horse chestnut). All of these are soothing ingredients that help treat the most common symptoms of eczema. Meanwhile, niacinamide and petrolatum help lock in moisture and improve hydration to reduce dryness and improve the lipid barrier. Aveeno’s Eczema Therapy Moisturizing Cream has an almost five-star rating, attesting to its efficacy. Oat is a top ingredient, as it helps soothe and restore the skin’s natural pH balance. Other ingredients include feverfew, which helps reduce redness, blackberry, which improves elastin and collagen to keep skin strong, and southernwood, which improves the moisture barrier. Together these ingredients create a formidable force against all the symptoms of eczema. This product has won Allure’s Best Moisturizer for Sensitive Skin Award. On average, it relieves itching in five days and begins to noticeably hydrate within seven days. It is specifically formulated to target the itching, redness, dryness and irritation associated with eczema. Active ingredients include glycerin, evening primrose oil and thermale spring water. These are all highly moisturizing ingredients that will help restore the damaged lipid barrier. Glycerin acts as a humectant to lock in hydration. Evening primrose oil has been shown to improve transepidermal water loss (TEWL), which occurs when the skin barrier is compromised and moisture is lost, resulting in dry, sensitive skin. Thermale spring water is also effectively and thoroughly moisturizing. Several strong ingredients combine to give this cream its potency. Coconut, aloe vera and allantoin are extremely soothing, relieving itchiness and redness. Hyaluronic acid, jojoba and vitamin B5 act as moisturizers to reduce dryness. Seaweed extracts and vitamin E are included to strengthen skin by improving elasticity. Oat complex, marine algae and Canadian willow herb are also soothing, further reducing redness and alleviating itchiness for a comfortable feel. This cream can also help relieve sunburn and the swelling and redness that come with it. A powerful moisturizer, First Aid Beauty’s Ultra Repair Cream attacks the symptoms of eczema to provide immediate comfort and relief. Colloidal oatmeal, allantoin and shea butter form the bulk of the ingredients. Colloidal oatmeal and allantoin act as skin soothers to reduce irritation and help calm redness and itching. Shea butter is a very strong skin conditioner that helps replenish moisture, keeping skin soft for quite a long time. This product also contains several antioxidants, including licorice root and feverfew, to help fight against environmental irritants that can worsen eczema. This cult favorite moisturizer is multi-purpose, and can be used on the lips, face, body, hands, eyes and even hair to replenish hydration. Its all-natural formulation makes it a favorite of celebrities like Kate Hudson, Rihanna and Lauren Conrad, and it simply works. In fact, the ingredients list is quite simple, including beeswax, honey, olive oil, bee pollen, propolis and royal jelly. These mostly bee-inspired ingredients provide antibacterial benefits while also working to reduce inflammation. Propolis, a type of resin created by bees, is especially great at reducing inflammation, a key factor in eczema. Honey is an antibacterial and calming ingredient, while royal jelly (created by honeybees to provide nourishment for their larvae and queen) soothes and hydrates. Eczema Honey was created by people who suffer from eczema themselves, and set out to find the very best treatment. Completely natural, its ingredient list boasts organic pure honey, organic almond oil, organic beeswax and organic sunflower oil. Honey is known for its antibacterial properties and wound-healing properties. When it comes to eczema, it has shown to be effective in studies in helping to prevent the condition. Honey also has moisturizing properties, ideal for people suffering from eczema. Organic almond oil, sunflower oil and beeswax also provide hydration to alleviate dryness and cracking. Neosporin’s eczema cream has a special formulation that combines a humectant, emollient, lipid and botanical to provide ultimate hydration and nourishment to dry, chapped and painful skin. It is steroid and antibiotic-free, and has been shown in clinical studies to relieve eczema symptoms in as little as three days while relieving itchiness upon contact. The colloidal oatmeal in this formula also helps to create a barrier that protects skin from outside irritants and the loss of moisture from environmental exposure. This product has also been approved by the National Eczema Association.